Since 1986 Bruker BioSpin has generously sponsored an annual lectureship and prize, given to a scientist who has made a major contribution to the application of ESR spectroscopy in chemical or biological systems. 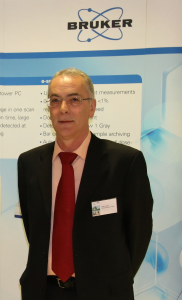 After thorough deliberation and consultation within the academic and industrial ESR community, the ESR Spectroscopy Group of the Royal Society of Chemistry has informed Bruker Corporation that the outstanding scientist whose seminal contributions to ESR spectroscopy the Group would like to recognise is, in fact, currently working at Bruker — we are pleased to announce that the 2017 Bruker Prize Lecturer is Dr Peter Höfer, the inventor of 2D HYSCORE spectroscopy who has also made major contributions to the development of pulsed ENDOR techniques. The lecture will be followed by the Bruker reception. The list of previous Bruker Prize winners is available here. 1. To be eligible for the Bruker ESR Thesis Prize, the thesis defence (viva voce examination or equivalent) must have taken place within 730 days of the deadline. 2. Applications should be submitted by the thesis author and must include a one-page summary, as well as letters of support from the thesis supervisor and one of the examiners (the external examiner where possible). 3. Theses that were previously submitted for the 2016 competition are still eligible if they fall within the dates above; authors of such theses should contact Ilya Kuprov (as below) but need not resubmit the paperwork. Submissions will be shortlisted by the RSC ESR Group Committee. Each of the shortlisted works will be sent to an expert reviewer, appointed by the Committee, for comments on quality, importance and impact. The Committee will then collate reviewer comments and make an award decision. The deadline for the 2017 Bruker Thesis Prize applications was 12:00 UK time on 01 December 2016. Applications are now closed. 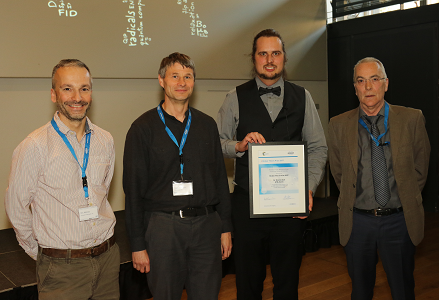 Congratulations to Dr Andrin Doll (ETH Zürich), winner of the 3rd Bruker thesis prize. We are grateful to Bruker for their continued support of this prize, and are pleased to confirm that the thesis prize will be awarded again in 2018 at the 51st Annual International Meeting of the RSC ESR spectroscopy group, at Queen Mary University of London, 8th–12th April 2018. Please check back here in autumn 2017 for application details.